Sometimes it's fun to go outside the box and season ribs with something a little different. 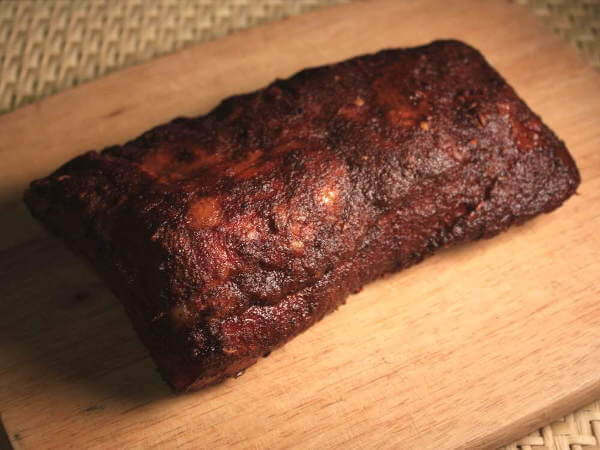 This recipe includes a couple of dried spices that aren't often seen in baby back rib recipes. The first ingredient, dried mustard seeds, isn't really all that unusual. Bottled mustard is often used to wet ribs and other meats to help the dry rub stick a little better. But the second ingredient has a unique flavor that's not usually associated with smoked ribs... juniper berries. If you've ever tasted gin, you're familiar with the pine-like aroma and flavor of juniper berries. Often used in Swedish and Norwegian dishes, when crushed and mixed with a few other ingredients the berries give the smoked baby back ribs a unique touch of flavor. What Are Baby Back Ribs? To classify as baby back ribs, the slabs should weigh under 1 and 3/4 pounds each. As a rule, the smaller sides are taken from younger pigs, but occasionally larger slabs can have a little extra taken off to meet the weight limit. The meat of baby back ribs is lean when compared to pork spare ribs. Baby backs are cut from the top section of the rib bones, near the lean and meaty pork loin. Spare ribs are taken from the lower ends of the ribs, the area close to the fatty pork belly. Preparing the baby backs doesn't take much time or effort since most of the work has usually been taken care of before they were packaged. The main consideration is to be sure that the membrane has been removed from the bone-side of the slab. Simply push a butter knife under the membrane between the ribs and lift. Grab the flap with a paper towel and peel if off. The membrane tends to be a little chewy when cooked, so it's a good idea to remove it. Another benefit is that with it removed, the meat on the bone side of the slab is exposed to the seasonings in the rib rub. There may be fat deposits exposed between the rib bones after the membrane is removed. Use the rounded end of a teaspoon to scrape the largest of those away, although most of that fat will melt away by the time the ribs are finished smoking. The star of this recipe is the combination of great whole spices that are best if crushed with a mortar and pestle. An electric spice mill will do the job as long as the dried spices aren't ground to a fine powder. With this recipe, the dry ingredients are mixed with olive oil and balsamic vinegar to create a rub paste that's smeared onto the ribs. 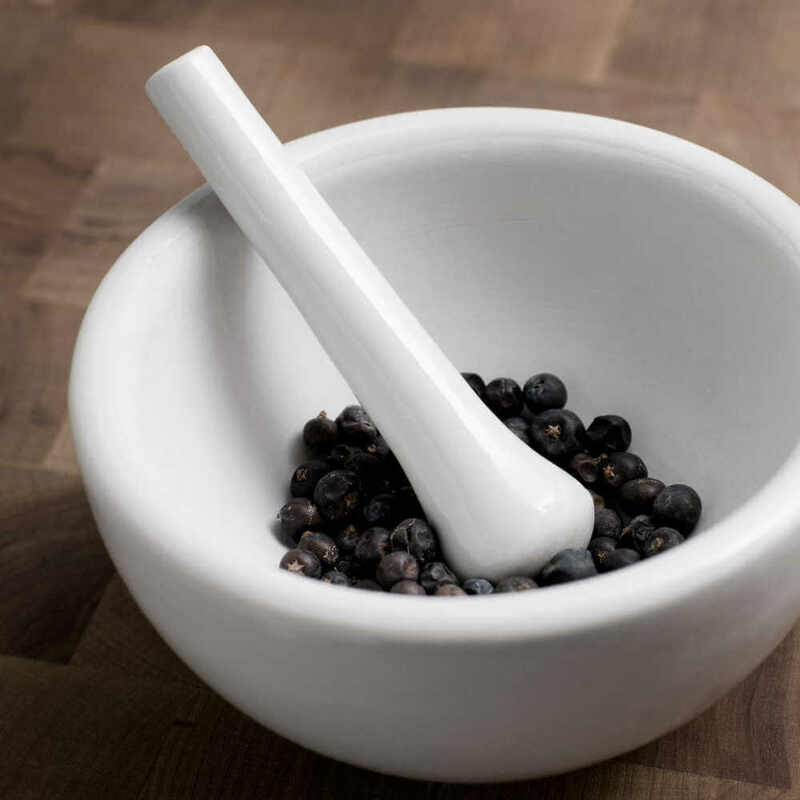 Crush the peppercorns, mustard seeds and dried juniper berries using a mortar and pestle, or in your trusty electric spice grinder (or coffee grinder). Don't over-grind the spices. The goal is to achieve a granule size similar to that of coarse ground black pepper. Combine with the brown sugar, salt and pepper flakes. Stir in the minced garlic, oil and vinegar to make the rub paste. Rub the mixture onto both sides of the baby back slabs. 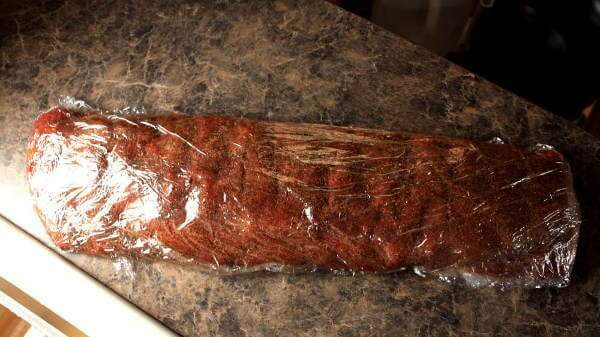 Wrap the seasoned ribs with plastic film and refrigerate them for at least one hour, and preferably overnight before cooking them in your smoker. A smoker temperature of 225˚ Fahrenheit is perfect for this baby back rib recipe, but up to 240˚ is fine. For my taste, you just can't beat a combination of oak and hickory for smoking baby backs, but any wood that you like to use for smoke will be just fine. Place the ribs on the cooking grate bone side down, and smoke for four to five hours. Try the pinch test for doneness. Give the meat between two bones a squeeze with your thumb and forefinger. If it gives easily, it's time to chow down. If it's still too firm, cook the ribs for another hour or so.